Retail display boxes provide an opportunity for you to market your brand and products, while also packaging them. This custom packaging solution combines practicality with advertisement, making it a cost effective and productive option for many businesses. We can create custom displays that sit on retailer’s floors or shelves. LeanPack can design them to ship assembled with your product or shipped flat for assembly at your retailer. We can even include assembly instruction sheets. In addition, we can also provide co-packing and fulfillment for your products. LeanPack also makes shipper/display boxes which are designed to be opened on a specific side and then folded back, or are crafted with tear away panels to reveal the product inside. 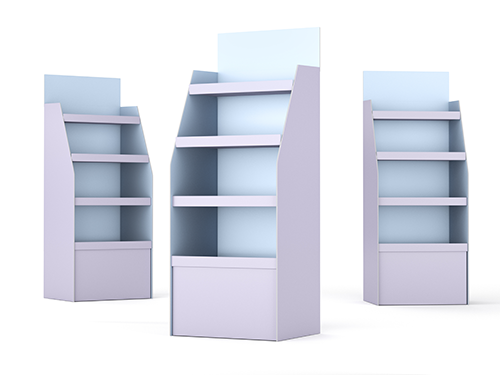 Within seconds, it can be placed on retail shelves without taking away from the aesthetics and branding of your company. Best of all we can produce small quantity displays with no tooling costs!